Mothers polish has been going strong ever since we introduced our first product. Mothers Mag & Aluminum Polish. We have as mcuh fun looking back as we do looking forward. As you would expect, there's been a lot of big changes over the years. Mothers Mag & Aluminum Polish was such a hit, that it wasn't long before customers were asking us to do the same for their paint as we had done fr their wheels. After some extensive testing, the Mothers California Gold Cleaner & Wax formula was born. Just the right balance of ingredients to bring back a shine on faded paint to better than factory original. In the early days, word-of-mouth was the only advertising that Mothers relied on. Even then, we had a hard time keeping up with the demand. 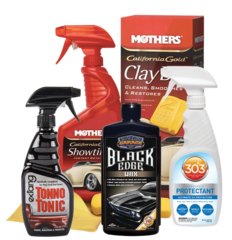 As we grew, we began to advertise to get the word out that Mothers Mag & Aluminum Polish our customers had come to know and love, was part of an expanding line of high quality car care cosmetic products.